The DXCC List is based on Clinton B. DeSoto's, W1CBD, landmark 1935 QST article, "How to Count Countries Worked, A New DX Scoring System." DeSoto's article discussed problems DXers had in determining how to count the DX, or entities, they had worked. He presented the solution that has worked successfully for succeeding generations of DXers. In DeSoto's words, "The basic rule is simple and direct: Each discrete geographical or political entity is considered to be a country." This rule has stood the test of time -- from the original list published in 1937, to the ARRL DXCC List of today. For more than 70 years, the DXCC List has been the standard for DXers around the world. DeSoto never intended that all DXCC "countries" would be countries in the traditional sense of the word. Rather, they are the distinct geographic and political entities which DXers seek to contact. Individual achievement is measured by working and confirming the various entities comprising the DXCC List. This is the essence of the DXCC program. DXCC activity was interrupted by World War II, until 1947, when the program started anew. Contacts are valid from November 15, 1945, the date US amateurs were authorized by the FCC to return to the air. Over time, criteria for the DXCC List has changed. The List remains unchanged until an entity no longer satisfies the criteria under which it was added, at which time it is moved to the Deleted List. Thus, today's DXCC List does not fully conform with today's criteria since many entities are grandfathered under previous rules. 1. The DX Century Club Award, with certificate and lapel pin is available to Amateur Radio operators throughout the world (see the DXCC Award Fee Schedule). ARRL membership is required for DXCC applicants in the US, its possessions, and Puerto Rico. ARRL membership is not required for foreign applicants. All DXCC awards can be endorsed with country totals (see Rule 5). a) Mixed (general type): Contacts may be made using any mode since November 15, 1945.
b) Phone: Contacts must be made using radiotelephone since November 15, 1945. Confirmations for cross-mode contacts for this award must be dated September 30, 1981, or earlier. c) CW: Contacts must be made using CW since January 1, 1975. Confirmations for cross-mode contacts for this award must be dated September 30, 1981, or earlier. CW contacts dated December 31, 1974, or before, are credited as Mixed mode. d) Digital: Contacts can include QSOs using any/all digital modes, in any combination (except CW) since November 15, 1945. Digital modes include RTTY, PSK-31, JT65, etc. and any modes that are only machine-readable, and any that use computer sound card technology, with the exception of digital voice, which counts for Phone. p) 70 cm contacts must be made on 70 cm since November 15, 1945.
q) Satellite: Contacts must be made using satellites since March 1, 1965. Confirmations must indicate satellite QSO. Satellite contacts do not count toward any awards noted in a) through p) above. r) Five-Band DXCC (5BDXCC): The 5BDXCC certificate is available for working and confirming 100 current DXCC entities (deleted entities don't count for this award) on each of the following five bands: 80, 40, 20, 15 and 10 Meters. Contacts are valid from November 15, 1945. The 5BDXCC is endorsable for these additional bands: 160, 30, 17, 12, 6 and 2 Meters. 5BDXCC qualifiers are eligible for an individually engraved plaque. s) The DXCC Challenge Award is available for working and confirming at least 1,000 DXCC band-entities on any Amateur bands, 160 through 6 meters (except 60 meters). Plaques can be endorsed in increments of 500 entities for each band are totaled to give the Challenge standing. Deleted entities do not count for this award. All contacts must be made after November 15, 1945. QSOs for the 160, 80, 40, 30, 20, 17, 15, 12, 10 and 6 meter bands qualify for this award. Confirmations on bands with less than 100 entities are acceptable for credit for this award. Certificates are not available for this award. t) The DeSoto Cup is presented to the DXCC Challenge leader as of the 31st of December each year. The DeSoto Cup is named for Clinton B. DeSoto, whose definitive article in October 1935 QST - How to Count Countries Worked A New DX Scoring System, shapes the DXCC award program. Only one cup will be awarded to any single individual. A medal will be presented to a repeat winner in subsequent years. Medals will also be awarded to the second and third place winners each year. i) Mixed: To qualify, you must have a total confirmed entity count that places you among the numerical top ten DXCC entities total on the current DXCC List (example: if there are 341 current DXCC entities, you must have at least 332 entities confirmed). Deleted entities do not count towards the DXCC Honor Roll. ii) Phone -- same as Mixed. iii) CW -- same as Mixed. iv) Digital -- same as Mixed. To establish the number of DXCC entity credits needed to qualify for the Honor Roll, the maximum possible number of current entities available for credit is published daily on the ARRL DXCC standings web page. First-time Honor Roll members are recognized daily also on the ARRL DXCC standings web page. Complete Honor Roll standings are published annually in QST. Once recognized on this list, or in a subsequent daily update of new members, you retain your Honor Roll standing until the next standings list is published. In addition, Honor Roll members who have been listed in the previous Honor Roll Listings, or have gained Honor Roll status in a subsequent daily listing, are recognized in the DXCC Annual List. Honor Roll qualifiers receive an Honor Roll endorsement sticker for their DXCC certificate and are eligible for an Honor Roll lapel pin and an Honor Roll plaque. Contact the DXCC Desk for details or check out the Century Club Item Order Form. v) #1 Honor Roll: To qualify for a Mixed, Phone, CW or Digital, you must have worked every entity on the current DXCC List. There are 340 current entities on The ARRL DXCC List. Contact the DXCC Desk for details. 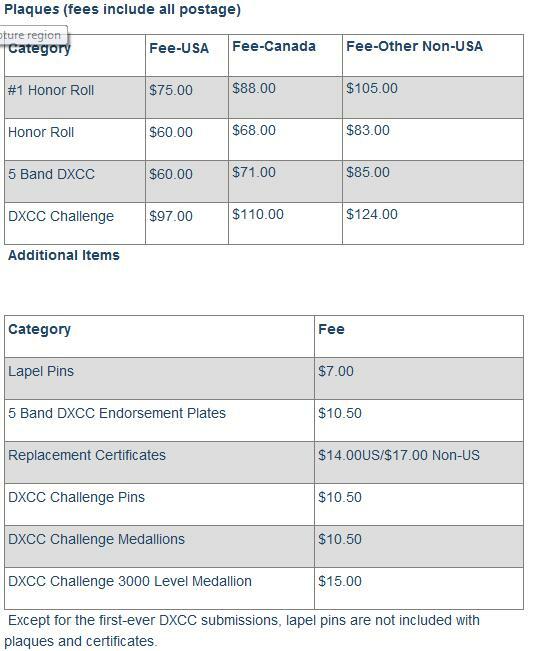 #1 Honor Roll qualifiers receive a #1 Honor Roll endorsement sticker for their DXCC certificate and are eligible for a #1 Honor Roll plaque and a #1 Honor Roll lapel pin . 2. Written Proof: Except in cases where the rules of Section IV apply, proof of two-way communication (contacts) must be submitted directly to ARRL HQ for all DXCC credits claimed. Photocopies and electronically transmitted confirmations (including, but not limited to fax and e-mail) are not currently acceptable for DXCC purposes. Exception: Confirmations created and delivered by ARRL’s Logbook of the World program are acceptable for DXCC credit. The use of a current official DXCC application form or an approved facsimile (for example, exactly reproduced by a computer program) is required. Such forms must include provision for listing call signs, dates, bands, modes and DXCC entity names. Complete application materials are available from ARRL HQ. Confirmations for a total of 100 or more different DXCC credits must be included with your first application. Cards contained in the original received envelopes or in albums will be returned at applicant's expense without processing. 3. The ARRL DXCC List is based on the DXCC List Criteria. 4. Confirmation data for two-way communications must include the call signs of both stations, the entity name as shown in the DXCC List, mode, date, time and band. Except as permitted in Rule 1, cross-mode contacts are not permitted for DXCC credits. Confirmations not containing all required information may be rejected. 5. Endorsement stickers for affixing to certificates or pins will be awarded as additional DXCC credits are granted. For the Mixed, Phone, CW, Digital, 40, 30, 20, 17, 15, 12 and 10-Meter DXCC, stickers are provided in exact multiples of 50 (i.e. 150, 200) etc. 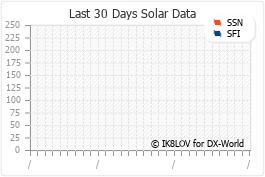 between 100 and 250 DXCC credits, in multiples of 25 between 250 and 300, and in multiples of 5 above 300 DXCC credits. For 160-Meter, 80-Meter, 6-Meter, 2-Meter and Satellite DXCC, the stickers are issued in exact multiples of 25 starting at 125 and in multiples of 10 above 200, and in multiples of 5 between 250 and 300. Confirmations for DXCC credit may be submitted in any increment, but stickers and listings are provided only after a new level has been attained. 6. All contacts must be made with amateur stations working in the authorized amateur bands or with other stations licensed or authorized to work amateurs. Contacts made through "repeater" devices or any other power relay methods (other than satellites for Satellite DXCC) are not valid for DXCC credit. 7. Any Amateur Radio operation should take place only with the complete approval and understanding of appropriate administration officials. In countries where amateurs are licensed in the normal manner, credit may be claimed only for stations using regular government-assigned call signs or portable call signs, where reciprocal agreements exist or the host government has so authorized portable operation. Without documentation supporting the operation of an amateur station, credit will not be allowed for contacts with such stations in any country that has temporarily or permanently closed down Amateur Radio operations by special government edict or policy where amateur licenses were formerly issued in the normal manner. In any case, credit will be given for contacts where adequate evidence of authorization by appropriate authorities exists, notwithstanding any such previous or subsequent edict or policy. 10. All contacts must be made using call signs issued to the same station licensee. Contacts made by an operator other than the licensee must be made from a station owned and usually operated by the licensee, and must be made in accordance with the regulations governing the license grant. Contacts may be made from other stations provided they are personally made by the licensee. The intent of this rule is to prohibit credit for contacts made for you by another operator from another location. You may combine confirmations from several call signs held for credit to one DXCC award, as long as the provisions of Rule 9 are met. Contacts made from club stations using a club call sign may not be used for credit to an individual's DXCC. 11. All confirmations must be submitted exactly as received by the applicant. The submission of altered, forged, or otherwise invalid confirmations for DXCC credit may result in disqualification of the applicant and forfeiture of any right to DXCC membership. Determinations by the ARRL Awards Committee concerning submissions or disqualification shall be final. The ARRL Awards Committee shall also determine the future eligibility of any DXCC applicant who has ever been barred from DXCC. 13. Conduct: Exemplary conduct is expected of all amateur radio operators participating in the DXCC program. Evidence of intentionally disruptive operating practices or inappropriate ethical conduct in any aspect of DXCC participation may lead to disqualification from all participation in the program by action of the ARRL Awards Committee. a) The submission of forged or altered confirmations. b) The presentation of forged or altered documents in support of an operation. c) Participation in activities that create an unfavorable impression of amateur radio with government authorities. Such activities include malicious attempts to cause disruption or negatively affect the accreditation of an operation. d) Blatant inequities in confirmation (QSL) procedures. Continued refusal to issue QSLs under certain circumstances may lead to disqualification. Complaints relating to monetary issues involved in QSLing will generally not be considered. a) Observing all pertinent governmental regulations for Amateur Radio in the country or countries concerned. b) Observing all DXCC rules. c) Being bound by the DXCC rules. d) Being bound by the decisions of the ARRL Awards Committee. 16. Fees: Find the most up-to-date fee schedule. The ARRL DXCC List is the result of progressive changes in DXing since 1945. Each entity on the DXCC List contains some definable political or geographical distinctiveness. While the general policy for qualifying entities for the DXCC List has remained the same, there has been a gradual evolution in the specific details of criteria which are used to test entities for their qualifications. The full DXCC List does not conform completely with current criteria; for some of the listings were recognized from pre-WWII or were accredited with earlier versions of the criteria. In order to maintain continuity with the past, as well as to maintain a robust DXCC List, all entities on the List at the time the 1998 revision became effective were retained. Certain terms occur frequently in the DXCC criteria and are listed here. Not all of the definitions given are used directly in the criteria, but are listed in anticipation of their future use. Entity: A listing on the DXCC List; a counter for DXCC awards, previously denoted as a DXCC "Country." Event: An historical occurrence, such as date of admission to UN or ITU that may be used in determining listing status. Event Date: The date an Event occurs. This is the Start Date of all Event Entities. Event Entity: An Entity created as the result of the occurrence of an Event. Deletion Date: Date when an entity is added to the Deleted Entities List. Discovery Entity: An Entity "Discovered" after the listing is complete. This applies only to Geographic Entities, and may occur after a future rule change, or after an Event has changed its status. Discovery Date: Date of the rule change or Event which prompts addition of the Entity. This is the Start Date for a Discovery Entity. Original Listing: An Entity which was on the DXCC List at the time of inception. Start Date: The date after which confirmed two-way contact credits may be counted for DXCC awards. Add Date: The date when the Entity will be added to the List, and cards will be accepted. This date is for administrative purposes only, and will occur after the Start Date. Island: A naturally formed area of land surrounded by water, the surface of which is above water at high tide. For the purposes of this award, it must consist of connected land, of which at least two surface points must be separated from each other by not less than 100 meters measured in a straight line from point to point. All of the connected land must be above the high tide mark, as demonstrated on a chart of sufficient scale. For the purposes of this award, any island, reef, or rocks of less than this size shall not be considered in the application of the water separation criteria described in Part 2 of the criteria. Additions to the DXCC List may be made from time to time as world conditions dictate. Entities may also be removed from the List as a result of political or geographic change. Entities deleted from the List may be returned to the List in the future, should they qualify again in the future under these criteria. However, an entity that does qualify again in the future does so as a totally new Entity, not as a reinstated old one. For inclusion in the DXCC List, conditions as set out below must be met. Listing is not contingent upon whether operation has occurred or will occur, but only upon the qualifications of the Entity. Political Entities are those areas which are separated by reason of government or political division. They generally contain an indigenous population which is not predominantly composed of military or scientific personnel. a) The entity is a UN Member State. b) The entity has been assigned a callsign prefix bloc by the ITU. (The exceptions to this rule are international organizations, such as the UN and ICAO. These Entities are classified under Special Areas, 3.a); and Ineligible Areas, 4.b).) A provisional prefix bloc assignment may be made by the Secretary General of ITU. Should such provisional assignments not be ratified later by the full ITU, the Entity will be deleted from the DXCC List. c) The entity contains a permanent population, is administered by a local government, and is located at least 800 km from its parent. To satisfy the "permanent population" and "administered by a local government" criteria of this sub-section, an Entity must be listed on either (a) the U.S. Department of State's list of "Dependencies and Areas of Special Sovereignty" as having a local "AdministrativeCenter," or (b) the United Nations list of "Non-Self-Governing Territories." New Entities satisfying one or more of the conditions above will be added to the DXCC List by administrative action as of their "Event Date." Entities qualifying under this section will be referred to as the "Parent" when considering separation under the section "Geographical Separation." Only entities in this group will be acceptable as a Parent for separation purposes. A new Entity results when part of a DXCC Entity is separated from its Parent by 100 kilometers or more of land of another DXCC Entity. Inland waters may be included in the measurement. The test for separation into two areas requires that a line drawn along a great circle in any direction from any part of the proposed Entity must not touch the Parent before crossing 100 kilometers of the intervening DXCC Entity. i) The island is separated from its Parent, and any other islands that make up the DXCC entity that contains the Parent, by 350 kilometers or more. Measurement of islands in a group begins with measurement from the island containing the capital city. Only one entity of this type may be attached to any Parent. ii) The island is separated from its Parent by 350 kilometers or more, and from any other island attached to that Parent in the same or a different island group by 800 kilometers or more. The Special Areas listed here may not be divided into additional Entities under the DXCC Rules. None of these constitute a Parent Entity, and none creates a precedent for the addition of similar or additional Entities. a) The International Telecommunications Union in Geneva (4U1ITU) shall, because of its significance to world telecommunications, be considered as a Special Entity. No additional UN locations will be considered under this ruling. b) The Antarctic Treaty, signed on December 1, 1959 and entered into force on June 23, 1961, establishes the legal framework for the management of Antarctica. The treaty covers, as stated in Article 6, all land and ice shelves below 60 degrees South. This area is known as the Antarctic Treaty Zone. Article 4 establishes that parties to the treaty will not recognize, dispute, or establish territorial claims and that they will assert no new claims while the treaty is in force. Under Article 10, the treaty States will discourage activities by any country in Antarctica that are contrary to the terms of the treaty. In view of these Treaty provisions, no new entities below 60 degrees south will be added to the DXCC List as long as the Treaty remains in force. c) The SpratlyIslands, due to the nature of conflicting claims, and without recognizing or refuting any claim, is recognized as a Special Entity. Operations from this area will be accepted with the necessary permissions issued by an occupying Entity. Operations without such permissions, such as with a self-assigned (e.g., 1S) callsign, will not be recognized for DXCC credit. d) Control of Western Sahara (S0) is currently an issue between Morocco and the indigenous population. The UN has stationed a peacekeeping force there. Until the sovereignty issue is settled, only operations licensed by the RASD shall count for DXCC purposes. e) Entities on the 1998 DXCC List that do not qualify under the current criteria remain as long as they retain the status under which they were originally added. A change in that status will result in a review in accordance with Rule 5 of this Section. i) Any extraterritorial legal Entity of any nature including, but not limited to, embassies, consulates, monuments, offices of the United Nations agencies or related organizations, other inter-governmental organizations or diplomatic missions. ii) Any area with limited sovereignty or ceremonial status, such as monuments, indigenous areas, reservations, and homelands. iii) Any area classified as a Demilitarized Zone, Neutral Zone or Buffer Zone. b) Any area which is unclaimed or not owned by any recognized government is not eligible for inclusion on the DXCC List and will not count for DXCC purposes. a) An Entity may be deleted from the List if it no longer satisfies the criteria under which it was added. However, if the Entity continues to meet one or more currently existing rules, it will remain on the List. ii) The error was made less than five years earlier than its proposed deletion date. c) A change in the DXCC Criteria shall not affect the status of any Entity on the DXCC List at the time of the change. In other words, criteria changes will not be applied retroactively to Entities on the List. 1. Each nation of the world manages its telecommunications affairs differently. Therefore, a rigid, universal accreditation procedure cannot be applied in all situations. During more than 50 years of DXCC administration, basic standards have evolved in establishing the legitimacy of an operation. It is the purpose of this section to establish guidelines that will assure that DXCC credit is given only for contacts with operations that are conducted with proper licensing and have established a legitimate physical presence within the entity to be credited. Any operation that satisfies these conditions (in addition to the applicable elements of SECTIONI., Rules 6, 7, 8, and 9) will be accredited. It is the intent of the DXCC administration to be guided by the actions of sovereign nations when considering the accreditation of amateur radio operation within their jurisdiction. DXCC will be reasonably flexible in reviewing licensing documentation. Conversely, findings by a host government indicating non-compliance with their amateur radio regulations may cause denial or revocation of accreditation. a) The vast majority of operations are accredited routinely without a requirement for the submission of authenticating documentation. However, all such documents should be retained by the operator in the unlikely event of a protest. b) In countries where Amateur Radio operation has not been permitted or has been suspended or where some reluctance to authorize amateur stations has been noted, authenticating documents may be required before accrediting an operation. c) Special permission may be required from a governmental agency or private party before entering certain DXCC entities for the purpose of conducting amateur radio operations even though the entity is part of a country with no amateur radio restrictions. Examples of such entities are Desecheo I. (KP5), Palmyra I. (KH5) and GloriosoIslands (FR/G). a) Photocopy of license or operating authorization. b) Photocopy of passport entry and exit stamps. c) For islands, a landing permit and a signed statement of the transporting ship's, boat's, or aircraft's captain, showing all pertinent data, such as date, place of landing, etc. d) For locations where special permission is known to be required to gain access, evidence of this permission must be presented. e) It is expected that all DXpeditions will observe any environmental rules promulgated by the administration under whose authority the operation takes place. In the event that no such rules are actually promulgated, the DXpedition should leave the DXpedition site as they found it. 4. These accreditation requirements are intended to preserve the integrity of the DXCC program and to ensure that the program does not encourage amateurs to "bend the rules" in their enthusiasm, possibly jeopardizing the future development of Amateur Radio. Every effort will be made to apply these criteria uniformly and to make a determination consistent with these objectives. QSL cards for new DXCC awards and endorsements may be checked by a DXCC Card Checker. This program applies to any DXCC award for an individual or station, except those specifically excluded. a) All current entities dating back to November 15, 1945 can be checked. Cards for deleted entities and cards indicating 160 meters must be submitted to ARRL HQ. b) The ARRL Awards Committee determines which entities are eligible for Field Checking. i) The Section Manager of the section in which the prospective checker resides. ii) An ARRL affiliated DX specialty club with at least 25 members who are DXCC members, and which has DX as its primary interest. If there are any questions regarding the validity of a DX club, the issue shall be determined by the division director where the DX club is located. A person does not have to be a member of a nominating DX club. b) Appointments are limited to one per section, one per DX club, and one per Division. i) Those nominated as a Card Checker must be of known integrity, and must be personally known to the person nominating them for appointment. ii) Candidates must be ARRL members who hold a DXCC award endorsed for at least 150 entities. iii) Candidates must complete an open book test about DXCC rules concerning QSL cards and the Card Checker training guide. iv) The applicant must be willing to serve at reasonable times and places, including at least one state or Division ARRL Convention each year. v) The applicant must have e-mail and internet capabilities, and must maintain a current e-mail address with DXCC Desk. Applications for DXCC Card Checkers are approved by the Director of the ARRL Division in which they reside and are appointed by the Membership and Volunteer Programs Manager. e) Appointments are made for a two year period. Retention of appointees is determined by performance as determined by the DXCC Desk. a) Only eligible cards can be checked by DXCC Card Checkers. An application for a new award shall contain a minimum of 100 QSL confirmations from the list and shall not contain any QSLs that are not eligible for this program. Additional cards may not be sent to HQ with field checked applications. The application may contain any number of cards, subject to eligibility requirements and fees as determined by Section I, Basic, 15.
b) It is the applicant's responsibility to get cards to and from the DXCC Card Checker. c) Checkers may, at their own discretion, handle members' cards by mail. d) The ARRL is not responsible for cards handled by DXCC Card Checkers and will not honor any claims. e) The QSL cards may be checked by one DXCC Card Checker. g) The applicant shall provide a SASE addressed to ARRL HQ, or, sufficient postage, to the DXCC Card Checker for mailing applications to ARRL HQ. The applicant shall also provide the applicable fees (check or money order payable to ARRL; credit card number and expiration date is also acceptable. Cash is OK, but not recommended). 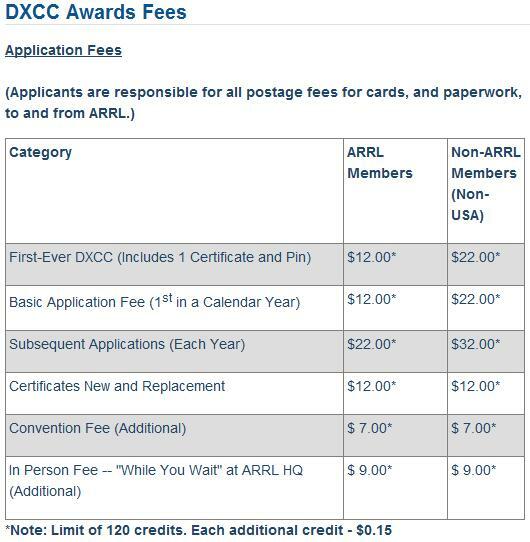 h) The DXCC Card Checker will forward completed applications and appropriate fee(s) to ARRL HQ. a) ARRL HQ staff will receive field-checked applications, enter application data into DXCC records and issue DXCC credits and awards as appropriate. b) ARRL HQ staff will perform random audits of applications. Applicants or members may be requested to forward cards to HQ for checking before or after credit is issued. c) The applicant and the DXCC Card Checker will be advised of any errors or discrepancies encountered by ARRL staff. d) ARRL HQ staff provides instructions and guidelines to DXCC Card Checkers. 5) Applicants and DXCC members may send cards to ARRL HQ at any time for review or recheck if the individual feels that an incorrect determination has been made.